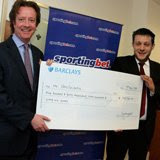 Last week, Sportingbet.com congratulated a lucky Greek customer on his €940,966 jackpot win by flying him and five of his friends and family to London to receive his winnings and celebrate his incredible good fortune. After toasting his win at Sportingbet’s London offices, the young accountant and his entourage were taken to lunch after which he and his proud fiancé went on a shopping spree. Mr. K Vasileiadis staked a relatively small amount (€27) on the Super Seven’s online slot machine and won the massive jackpot of €940,966. This is the largest online casino win in Greece ever, and the biggest casino win on Sportingbet.com. Vasileiadis, who usually plays at Sportingbet.com for a few hours each weekend, said the massive win has certainly changed his life but that he has no plans to leave his job. His fiancé said that their wedding would probably be bigger and sooner than planned though. Everyday hundreds of people win at Sportingbet.com, and Mr. Vasileiadis’ success is an excellent example of how online casino’s can and do produce real winners. “We believe that the customer journey from depositing to winning should provide them with the ultimate gaming experience,” added the CEO.